A FORMER child actor came face-to-face with the woman she once played, during a book signing. Ali Lewis was signing copies of debut novel, Everybody Jam, at White Rose Books, in Thirsk, North Yorkshire, on Saturday. Ms Lewis played Rosie Page, daughter of Alf Wight, better known as James Herriot, in the TV series All Creatures Great and Small. The two were reunited at the event on Saturday. you are so lucky to have met a most remarkable man. i always do my children’s book report on mr. herriot’s books. the teacher always asks for the books and never returns them. well so much for my james herriot collection. i love james herriot! 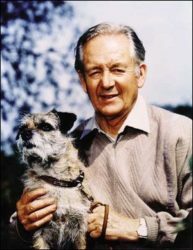 Next PostNext Happy Birthday, James Herriot!